I am so excited! I have been so blessed since I have been on the design team at Sparkle n Sprinkle. Margaret is such a great person to work with and all around! She has given me so many opportunities to grow and stretch my creative wings. She has been wanting me to come to a show with her and work and demo, but I have just not had the time until now. This weekend I am going with them to the Creating Keepsakes show in Ft Lauderdale. So if you are down in that area please stop by and say hi, I'd love to meet you!. Since it is a scrapbook fair I thought I would make a scrap page to take with showing some different ways you can use her wonderful embossing powders in your scrapbooking. I went through my stack of pictures that I have already scrapped and picked some. This was a special day to me and I really love these pictures. You've seen the new papers where there is embossing already done on the pages?? Well, I wanted to make my own. 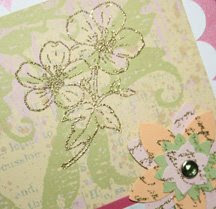 So I took some plain designer paper that I picked up at Michaels and stamped all over it with the Wild Geranium and Primrose stamps using Versamark, then sprinkled it with Golden Sparkle EP and heated. I cut it down to 11 x 11 and made a white scallop border using the slit punch. I layered this on the base of a pink shimmery paper from ColorBok. The flower embellishments were made by stamping the French Writing stamp in Versamark and embossing again with Golden Sparkle, then using various flower punches to punch them out. 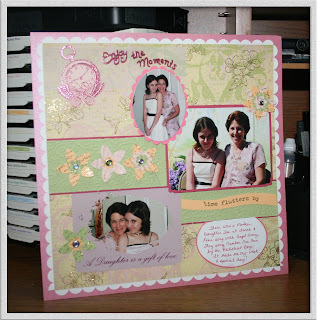 I layered them and used a Rhinestone brad to adhere them to the page. The background for the flowers is Certainly Celery, run through my Textile Cuttlebug folder, then layered on Rose Red. For the title I wrote out what I wanted on vellum first, then traced over it with my Versa Marker and embossed it with Cordial Red EP. 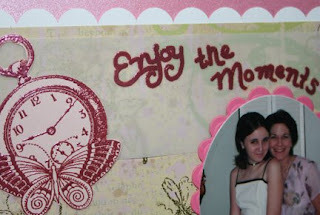 The Clock Collage was also embossed with it on Blush Blossom and cut out. To adhere the vellum to the page I used the glue pen and traced the letters on the backside and stuck it down. I also added some glue behind the clock. I also stamped the Time Flutters By with Versamark and embossed it with Golden Sparkles on Apricot Appeal cardstock and used my Creative Memories wavy cutter. 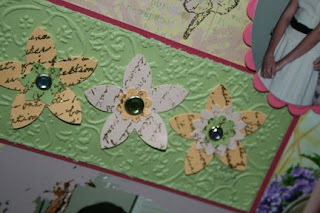 Punches, Rhinestone brads and some cardstock is Stampin' Up! I also used my Oval Nestibilites, and Creative Memories corner punch. OH MY!! Getting back that stamp room has given you room to create. Love you page and I'm sure you worked hard on getting it JUST RIGHT!!! Wow! This is awesome! Great job! I hope you have a great time with Margaret at the show! I wish I could be there with you and meet you both in person!!! Really sweet, serene page. You are sooo talented and inspire me every day! Be safe in Ft. Lauderdale and hope you have a fun fun fun time!